Republicans are clutching at straws as they search for reasons to oppose Obama's nominee. 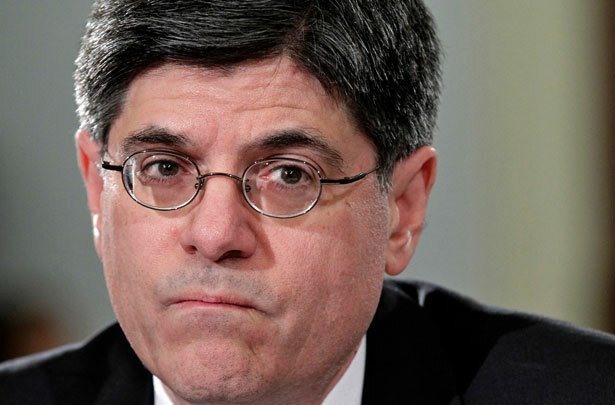 There are many, many important lines of questioning for Jack Lew as he faces Senate confirmation to be the next Treasury secretary. Unfortunately, as is too often the case, Republicans seem uninterested in pursuing them—and have instead settled on a truly ridiculous, and entirely hypocritical, plan to slow down his nomination. The GOP says the administration’s failure to issue a plan to slash Medicare, which they assert is required by an obscure federal provision, has put Lew’s nomination “at risk.” The silliness of that requirement aside, nobody in the GOP appears to have noticed that the provision also applies to Republicans in Congress—and they’ve also failed to act. Here’s the background: when crafting the 2003 Medicare Prescription Drug, Improvement, and Modernization Act, the hugely controversial bill that brought us the Medicare Part D drug plan, the Bush administration and Republicans in Congress inserted a little-noticed clause intended to force deep cuts in Medicare several years later. Buried in the legislation was something known as the “Medicare trigger.” It required the Medicare trustees to issue an annual “alert” if they determined that Medicare general revenues (that is, the amount collected in federal income taxes for the program) would finance more than 45 percent of Medicare expenditures over the next six years. This was supposed to be a warning that the program was becoming insolvent, despite the rather arbitrary selection of a 45 percent cutoff. Once that report has been issued by the trustees—which it has been every year since 2007—the bill said the president must send legislation to Congress within fifteen days, explaining how he or she will bring Medicare expenditures back under 45 percent of general revenue for the following six years. Congress must consider that legislation, but is not required to pass it. President Obama has completely ignored this provision for his entire first term—and now, since as Treasury Secretary, Lew would also become chairman of the Medicare trustees, and since he’s been in the White House for four years, Republicans think they have a big ol’ gotcha. “Congress will need documents pertaining to [Lew’s] role in the violation of this law, as well as a concrete legislative proposal that brings the administration into legal compliance,” said a letter from Alabama Senator Jeff Session last week to the White House. “Failure to do so could make it difficult for Mr. Lew’s nomination to move forward.” Eight GOP Senators sent a similar letter last week, too. You can see the beauty of this plan from the eyes of the GOP—even if they can’t stop Lew, perhaps they can get the White House to issue a sweeping plan to reduce Medicare, which is something the Republicans badly want but have been afraid to directly propose. Or at the very least, Republicans can beat the White House up for this supposed failure. Yet not since 2008 has any such bill been produced. Notably, for the two years that Republicans have controlled all three of those committees in the House, there have been no bills responding to the Medicare trigger, nor even any attempt The Nation can find to pass one out. The Senate Finance Committee, controlled by Democrats, has similarly failed. We can find no effort on behalf of the committee’s Republicans—many of whom signed that letter to the White House last week—to pass out a bill dealing with the Medicare trigger, either. If one gives credence to that argument, then Republicans have much more straightforwardly failed to respond to the Medicare trigger they’re so hyped up about. In any case, the trigger is worth ignoring—it’s only the Republican hypocrisy in doing so that’s notable. The Medicare trigger is a really cynical bit of policy: the 2003 legislation drastically expanded Medicare expenditures by creating Part D, so the trigger was designed to go off very quickly. And the way the trigger is set up virtually guarantees deep benefit cuts with no progressive tax increases. Think about it: if the president and Congress took the trigger seriously, they would have to create a plan that ensures the general fund revenue pays for less than 45 percent of Medicare expenditures. But that means the government can’t raise progressive income taxes, or that percentage would actually get higher. So instead the only remaining options would be raising regressive payroll taxes, raising premiums, or cutting benefits and provider payments. It would be extremely unusual for Obama to issue such a plan, which is likely why he hasn’t—the question is, if they’re so fired up about it, why hasn’t the GOP?